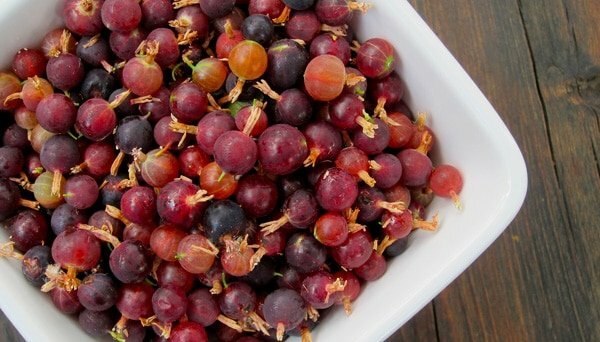 Ah, the gooseberry, an unloved berry if there ever was one — especially here in North America. We have nearly 100 varieties here, yet few people here even know they exist, let alone take to the woods in search of these beauties. Well, they do exist, and they are well worth your effort to hunt them up. Here’s what you need to know to gather ye gooseberries in style. First you must find them. Fortunately they grow pretty much everywhere on our continent, other than deserts… and there are even a few species that do thrive in arid regions. But in general, look for hills and mountains, cool(ish) climates and moisture. 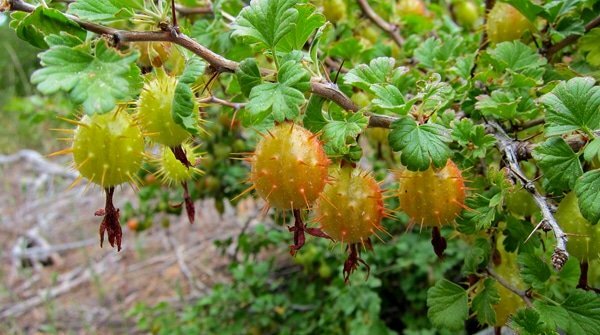 When you are in such a region, look for spiky shrubs: A hallmark of the gooseberry clan is that they almost always have thorns all over them, on the branches and even sometimes the berries themselves. Then there is the leaf. The maple-like leaves of gooseberries and their cousins the currants are very similar across all species. Memorize the shape of this leaf and you will start seeing it everywhere. 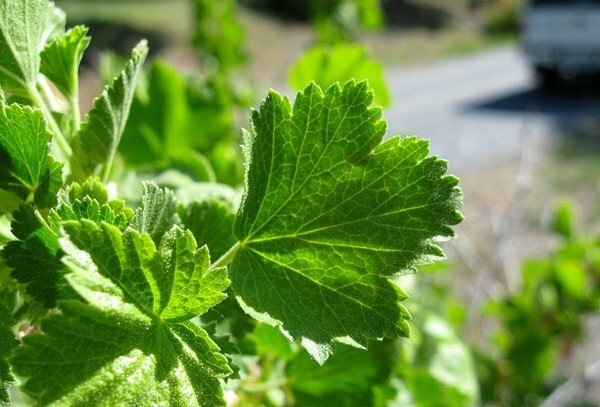 All currants and gooseberries have leaves that pretty much look like this. See the little “tail” on the bottom of the fruit? 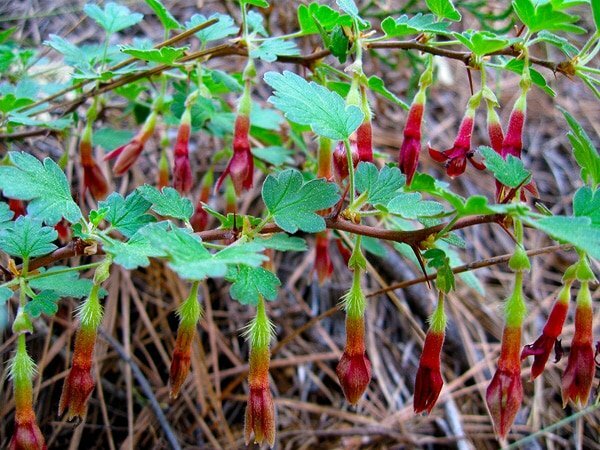 That’s the remnant of the flower, and it is another hallmark of the Ribes clan, which includes both currants and gooseberries. That little tail is perfectly edible, but you might want to remove it for fancy preparations. Now by now you might have noticed that wild gooseberries — especially these Sierra gooseberries above — are not the friendliest of fruits. I mean look at them! 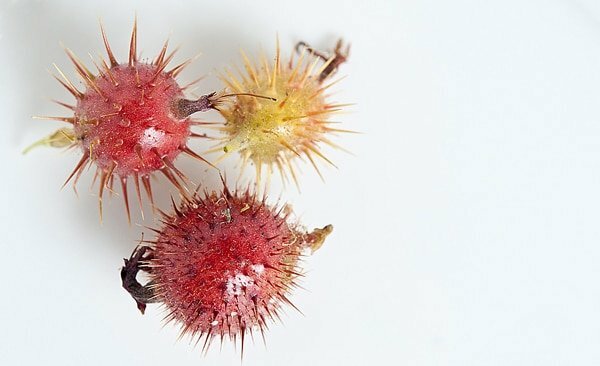 Nasty, spiky, prickly things that will impale your hands without a second thought. You must pick them with gloves or suffer the consequences. At least the Rocky Mountain wild gooseberry pictured at the top of this post not quite so prickly. Most of the gooseberries east of the Great Basin can be eaten off the bush, although they are very tart. But the Sierra gooseberry and its prickly cousin that lives along the Pacific Coast is a bit more challenging. Bottom line is you need to cook these. Cooking softens the spines and lets you get at the delicious pulp within, which tastes brightly acidic and a little sweet. The aroma is weirdly similar to like Sweet Tarts candy. The best way I’ve found to eat the prickly wild gooseberries is to cook them with a little water, smash the berries and strain the resulting pulp. The juice makes an excellent sorbet or syrup to use in cold drinks. It will also make a wonderful jelly. The pulp left behind can, it is said, be used as a pie filling, although I’ve never done that. If your gooseberries don’t look like little Sputnik satellites, you can just eat them. Since they are so tart, I love them with some sugar or honey and something dairy. My favorite way to eat them is to stir together mascarpone cheese with dark wildflower honey until combined, then fold in the gooseberries. Damn good. I do this mostly with Sierra gooseberries, but you can use this method with any other gooseberries, too. 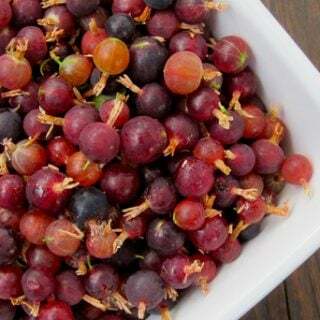 Wash your berries well and put the Sierra gooseberries into a large pot. This seems like a lot, but they are large and very spiky, so they take up more space than other gooseberries. If you have regular gooseberries -- wild or domestic -- only use 5 to 6 cups. Barely cover the berries with water, cover the pot and bring to a boil. Boil for 2 to 3 minutes. Turn off the heat and, using a potato masher, crush the berries to a pulp. Do not use a blender, food processor or immersion blender! If you do, you will merely make the nasty spikes smaller and harder to remove later. Let this steep, covered, until it gets to room temperature, then pour everything through a fine-meshed strainer into a container and let it sit overnight in the fridge. 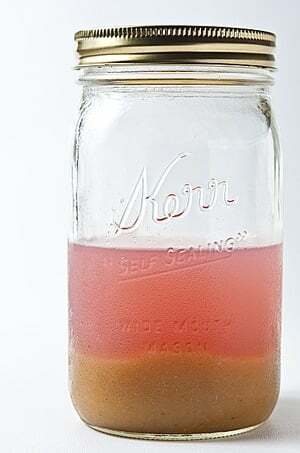 The sediment at the bottom will be tan, the juice varying degrees of red or purple -- if you are using ripe gooseberries. Strain again through a fine-meshed strainer with a piece of paper towel set inside. This will leave you with clear juice. This juice will store in the fridge for a week or so, as-is. Or you can heat the gooseberry juice with an equal volume of sugar and make gooseberry syrup. The syrup lasts months in the fridge. As for the sediment, taste it. If it is not too gritty, you can mix it with a thickener like tapioca and make it into a pie filling. Note that prep time does not include steeping time. 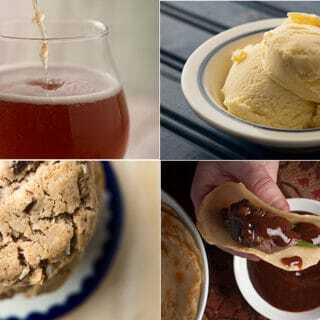 You can find more gooseberry recipes, as well as recipes for all kinds of other wild fruits, right here on Hunter Angler Gardener Cook. one thing that drives me slightly crazy about your foraging posts you rarely if ever note the season of harvest. Is this found in springtime? Summer? are the fruits up for a week like some? A month like others? I continually find this quite frustrating. Michael: Well, this is California, so you can find them as early as May in some places, and as late as November in others. Generally gooseberries in most of North America are found in high summer.